LORDSTOWN, Ohio – Four years in the making, the new Lordstown Energy Center stands as an example of how advanced technology is reshaping the industrial landscape of the Mahoning Valley, officials say. Hill says the energy center’s presence is an all-around benefit to Lordstown and its school district. An independent study conducted during the planning phase of the plant determined that the Lordstown Energy Center could result in an economic impact of more than $13 billion over the next 40 years. The energy center will provide more than $1 million annually to Lordstown schools over the next 15 years, and another $1 million donation helped the schools build a new stadium to support several sports. At the same time, the project created about 900 temporary construction jobs for tradesmen during the building phase. “We’re all happy that they’re here,” he says. The plant has the capacity to generate 940 megawatts of electricity, enough to provide power to about 850,000 homes. Lordstown Energy Center generates power and then sells it to the PJM electrical grid, a large electrical transmission network that serves states in the mid-Atlantic region and parts of the Midwest, including Ohio. Yet the technology used at the new plant is indicative of the new direction of the energy industry is taking. The Lordstown Energy Center is a combined-cycle generation plant, that is, it uses natural gas as its main fuel stock to power two large turbines. The heat generated from those operations is mixed with water and converted into steam, which is then used to power a large steam turbine. The Lordstown Energy Center’s proximity to the Utica shale play in Ohio and the Marcellus shale play in Pennsylvania – together one of the largest natural gas repositories in the world – ensures a steady stream of fuel supply for decades. That fuel supply is delivered to the plant through a single pipeline, which sits on 16 acres along Henn Parkway at the Lordstown Industrial Park. 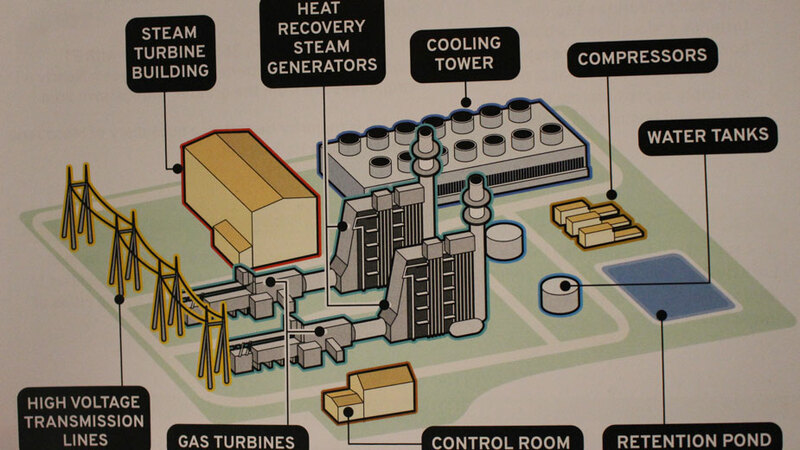 Pictured: Rendering of the Lordstown Energy Center. Indeed, with the exception of transmission lines sending power out, natural gas being pipe in, chemicals trucked in, and water supplied to the plant, everything regarding the operation is self-contained with little waste, Schneider says. Far less efficient are the coal-fired plants that today are having a difficult time of competing in the market. Measured by the plant’s “heat rate,” or the amount of energy used to generate one kilowatt of electricity, the Lordstown Energy Center has proven far more efficient than older plants, he says. The Lordstown Energy Center is one of six facilities in the United States that uses Siemens H-class Flex-Plant technology. Natural gas is fed into the site through a pipeline and into a compressor station at the east side of the development. The gas is then transmitted to two large natural-gas turbines, each of them connected to two towering heat recovery steam generators. Steam is fed to the steam turbine and exhaust from that operation is pushed back to the heat recovery system to be re-heated and reused in the steam turbine. The plant’s three generators collectively produce about 200,000 volts but that increases to 345,000 volts by the time it moves out of the transmission lines, Schneider says. 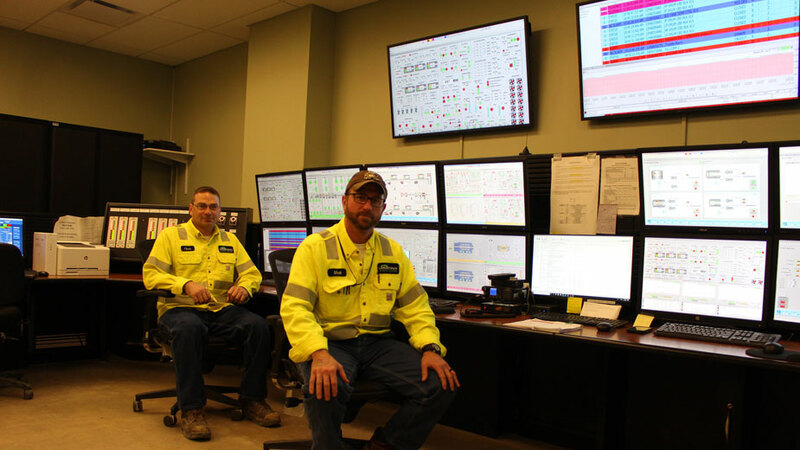 Pictured: Chris Borsic and Matt Wymer, operators of the control room at the Lordstown Energy Center. Normally, it would take just a single operator to staff the control room, Schneider says. However, the plant is using two at the moment because Lordstown Energy Center is still very early into its operations. The new plant employs 21 full-time, Schneider says, and about 100 tradesmen are still on-site placing the finishing touches on the plant. “They’re finishing up some of the odds and ends,” he says. Pictured at top: Drew Schneider, plant manager, stands in front of the new Lordstown Energy Center.